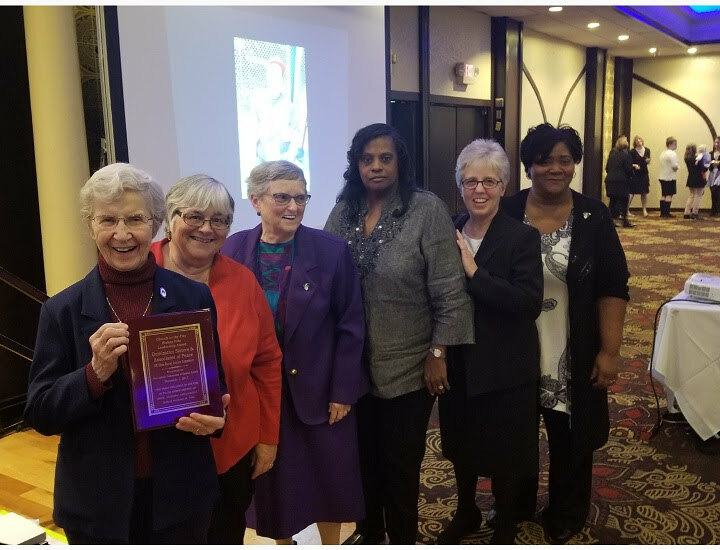 Dominican Sisters of Peace Racial Justice Committee Members attend the 39th Annual Bishop Cosgrove Justice Dinner and Silent Auction. Left to right: Sr. Barbara Catalano, OP; Pat Schnee, OPA; Sr. Valerie Shaul, OP; Celeste Williams, Sr. Cathy Arnold, OP, and Director of Associates Colette Parker, OPA. Nearly three years ago, a group of Sisters, Associates and Akron Motherhouse staff joined to help the local community learn to recognize, acknowledge and appreciate God’s beauty in those around them. Today, the Northeast Ohio Racial Justice Committee of the Dominican Sisters of Peace and Associates has been recognized as a leader in the fight against racism in their community. In 2016, the team launched a series called “Building Racial Harmony” to combat racism – the current common study of the Dominican Sisters of Peace community. The series aims to change cultural attitudes by educating people about the issue of racism, including its systemic nature; how it is perpetuated via micro-aggressions, implicit bias, and white privilege; and how it impacts the everyday lives of people of color. 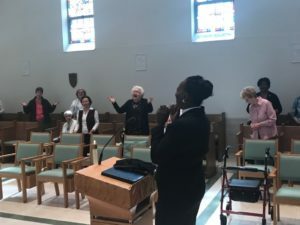 The committee has established the Akron Motherhouse as a safe place to dialogue about the sensitive issue of racism and as a center of prayer for the elimination of racism. Some of the series’ participants have said that the prayer services and conversations have been effective in enabling them to see the reality of racism and challenging them to uproot it from their lives and society. Much like Sr. Cathy, Associate Pat Schnee grew up in an environment where the people in her circle looked like her. Although she was brought up to believe that racism is wrong and that everyone is beautifully and perfectly made by God, Pat said the “Building Racial Harmony” series has broadened her horizons. “I realize that I have experienced a very small slice of life. The series has affected my brain by giving me data, information, and statistics. I might never have learned about things like white privilege or that racism could be internalized,” said Pat. Clergy and worshippers take part in an ecumenical prayer service at the Akron Motherhouse. Pat, Sr. Cathy, and other members of the committee hope that the “Building Racial Harmony” series will equip participants to help inspire and build a community, a nation, and a world where all people are equally valued and appreciated. Last year, the Catholic Commission of Summit County honored the committee for its work to combat racism with the Bishop Anthony M. Pilla Leadership Award. The award, named for the bishop emeritus of the Catholic Diocese of Cleveland, is given to individuals or groups working to promote social justice, peace, and human dignity. The Catholic Commission is a social action arm of Catholic Charities in the Diocese of Cleveland. The Dominican Sisters of Peace work across the country and around the world to build peace. Your prayers and your support make that work possible, and we thank God for your friendship every day. Click here to support our ministries around the world.